Balakrishnan, after killing his wife Sandhya on January 19, chopped her body and dumped the parts packed in plastic bags in garbage bins in Chennai, the police said. Sandhya was murdered on January 19 allegedly by her husband, Balakrishnan, Chennai police said. A filmmaker was arrested in Chennai on Wednesday for allegedly murdering his wife, an aspiring actress. The woman's body parts, without the head, were found in a dumpyard in the city last month. Filmmaker Balakrishnan was arrested after a vital clue - two tattoos on the severed hands of the body - helped police identify that it was his wife Sandhya, 37, who was murdered. The police, who began investigation last month with the tattoos designed like Shiva-Parvati and a dragon as clues, arrested Balakrishnan over two weeks after his wife's murder. A bangle too helped the probe. Balakrishnan, 51, killed his wife on January 19, chopped her body the next day and dumped the parts packed in plastic bags in garbage bins in different parts of Chennai, the police said. 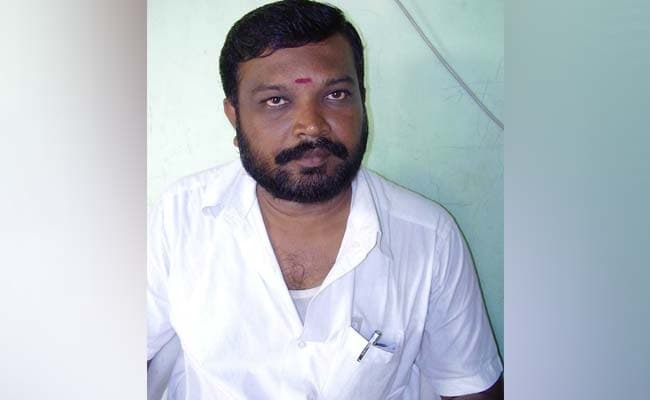 Director and producer Balakrishnan was arrested by Chennai Police on Wednesday. Pictures of the tattoos and the bangle were circulated and the first tip-off came from Sandhya's mother in Thoothukudi in southern Tamil Nadu. Balakrishnan had told the family that Sandhya had returned to Thoothukudi but was not accessible on phone. Soon, the police soon zeroed in on her husband. "We are on the lookout for the missing head with information the accused has given us," police officer Alvin told NDTV. Balakrishnan confessed to having committed the crime doubting Sandhya's loyalty, the police said. "Based on information he gave, another part of the woman's body was also found on Wednesday," the police said, adding that further investigation is on to find the woman's head and torso. The couple from Thoothukudi got married in 2000. Sandhya is fourteen years younger to Balakrishnan. Investigators say both have had problems in their relationship in the past. Last year, Sandhya had left their home and approached the police accusing her husband of domestic violence. They, however, patched up after a round of counselling. Balakrishnan has directed and produced a film called "Kadhal Ilavasam" and was allegedly demanding a huge amount of money from his wife's family to make another film.